When it comes to women’s boxing, Terri Moss is a champion. In multiple senses of the word. The Colorado-born Georgian went home with WIBA and WIBF world title belts following a win in her career finale back in 2007, and she’s spent many of the subsequent dozen years talking up the depth and breadth of the talent on the female side of the ledger. These days, she serves as CEO of both the Buckhead Fight Club and the black-tie Corporate Fight Night event series, and simultaneously bills herself as a professional boxing producer, promoter and trainer. Among her clients, the boxing team at Georgia Tech University, as well as unbeaten pros Deonte Brown and Abel Aparicio. So, needless to say, this is a big week for her. Moss is among the many fans reveling in the pre-fight publicity for this weekend’s women’s middleweight unification bout matching two-time Olympic gold medalist Claressa Shields and unbeaten European kingpin Christina Hammer at Boardwalk Hall in Atlantic City, New Jersey. The bout will headline a live Showtime broadcast – set for Saturday at 9 p.m. – that’ll also include a pair of men’s heavyweight fights involving unbeaten prospects Jermaine Franklin and Otto Wallin. BoxingScene.com caught up with the frenetic Moss to discuss her take on where the Shields/Hammer fight falls in women’s history, whether the winner will be able to carry the load for women’s boxing going forward and whether she’s frustrate that the breakthrough event didn’t happen during her career. BoxingScene.com: They may or may not be the best fighters in women’s history, but is this the biggest fight — or one of them — in women’s history, in your opinion? Terri Moss: Well for this country, you could say yes, it’s one of the biggest, or at least best-covered women’s fights in history. Showtime did an amazing job with Christy Martin when she fought on the Mike Tyson undercards, but the coverage was nothing like what we are seeing now in Shields/Hammer. Likewise, the competition for Christy – and the women fighters of our era – wasn’t elevated to what is in this fight for Shields and Hammer, but the lack of good competition was never the fault of the fighters. There just weren’t enough women fighters out there. We saw a little of this with Shields’ early opponents. 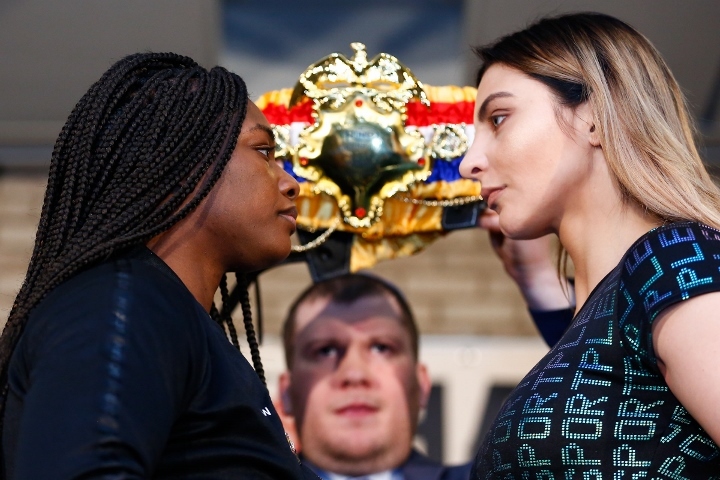 But for the first time in history, there is depth to the ranks of women’s boxing, so you could absolutely call this one of the biggest fights to date. If you go outside of the U.S., though, they’ve been doing high-profile women’s fights for over a decade with top competition, top pay and exposure. Regina Halmich in Germany was packing stadiums for years with the highest level of contender they could find. She fought everyone within a few weight classes, and she beat them all. Mariana Juarez in Mexico has been promoted and fought with excellent competition, as well as Jackie Nava. Yesica Bopp in Argentina – she’s one of my favorites – is also promoted like the men, and they’re doing a great job with Mikaela Mayer here in the States. I can’t forget to mention my own pound-for-pound pick in women’s pro boxing, Katie Taylor. Katie fights on the Anthony Joshua undercards against top lightweights, and she can pack Wimbledon, but even with all she brings the U.S.-based television companies wouldn’t show her fight. It’s extremely frustrating. Considering how little we get, yes, this is a huge step for us in the States, and this is a top-tier women’s fight. We are all just ready – including Claressa – for the ladies’ game to get a fair shake, especially now that the competition is worthy. Shields and Hammer are at the top of their games, they are at the top of the divisions. This is a good fight, yes sir. BoxingScene.com: Do you think fight deserves its billing and status? Terri Moss: In this division they are the best out there, so yes. If you had two men at the top of their divisions in this same weight class no one would question what the fight deserved. I would love to see all of the weight divisions get this kind of play, especially when it’s top-tier fighters for world title fights as it is with Shields/Hammer. BoxingScene.com: How effectively can the winner serve as the face of the women’s sport? How are you feeling these days about the state of the women’s game? What kind of progress has there been in your view? Terri Moss: In all honesty I like Shields in this fight. And that has nothing to do with her skill, it’s about her mentality. I think Claressa will represent women’s boxing well because she’s a real fighter. She came from nothing to build something. Sound familiar? It’s like 90 percent of the male fighters’ stories. Her confidence is unbeatable. She has all the tools that a male champion would be expected to have. With Claressa you don’t see a woman fighter, you see a fighter. That’s what we need. We need to be able to ditch the gender and just be fighters. I have no doubt that Hammer has been able to experience much better support, financial endowments and publicity, because that’s what it’s like for women fighters in Europe. The difference is that in Europe a woman fighter is still seen as the novelty of being a fighter that’s a woman. In Europe you have to be attractive to be promoted. You have to have marquee value. For Claressa, she’s just a raw, gritty fighter, and that’s what I like about her best. I’m super happy that Showtime decided to promote a fighter like that. Though of course the two gold medals didn’t hurt. This fight to me represents the past and the future. The novelty and the fighter. This fight will show the world that women can be fighters. Just fighters. BoxingScene.com: Does it ever frustrate you that these sorts of opportunities and events weren’t available in your prime? Terri Moss: Absolutely. But someone had to blaze the trail. This is a man’s sport. Well, it was. BoxingScene.com: What do you consider your peak moment or your most memorable moment in the ring? Terri Moss: (Laughing) If you knew much about my career you would probably be asking why I stayed. My whole career was a blazing stretch of really amazing, crazy, and nostalgic boxing experiences. I definitely experienced every angle of prize fighting in as much as a woman fighter can. I would say my most fond moment was my first title fight in Madrid against Maria Jesus Rosa in Madrid. I didn’t win the fight, but that was the first time I started to dream that women’s boxing could be something other than what sometimes felt like a raunchy side show, which was a lot of my experience before that. It gave me the first sparks of hope that we could do more and have more as fighters. It was then that I realized how bad is was for women fighters in the U.S. How can this country stand so crudely behind the rest of the world on basic human rights? That’s a much longer interview, so I will leave it at that. BoxingScene.com: How do you see the fight going? Terri Moss: I like Shields in this fight. Well I like them both, but if I were a betting person I would put my money on Shields. BoxingScene.com: Will you be watching? Terri Moss: Definitely! I had planned to go but have too many commitments that weekend. I’m cheering for them both, but mostly for this to be an excellent fight!